Have you ever wondered what the main benefits of scanning your documents really are? Is it really worth scanning all of the records in your office? There are plenty of reasons that using a scan service is beneficial, but here are the top seven that might help you decide if scanning is right for you. Having everything scanned onto your computer system is a huge time saver. Instead of spending your time running around the office trying to find a document from years ago, you could easily just pull it up on your computer. You don’t run the risk of losing an important document. Because everything is stored online, you have to go out of your way to delete a document. When you have boxes of important paperwork lying around the office, you are pretty much begging to lose something of value eventually. Who doesn’t want to save space in their office? When you run a busy office, it can already be stressful, but throw in a bunch of paperwork and clutter and it only makes it harder to work. Manage your records to the best of your ability. 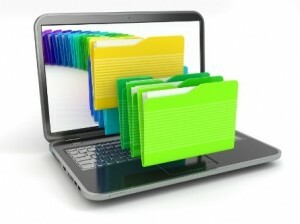 When everything is stored on your computer, it makes managing your records as easy as can be. You can pull up anything you want to within seconds and you have security to help maintain everything. What would you do if a disaster struck? Most offices don’t think that a natural disaster could ever affect them, but what if it does? All of the records that hold your company together would be gone. And that is devastating to any business. Don’t ever risk leaving a document at home. Have you ever forgotten an important document at home and had to be late to that important meeting? If you keep everything stored on your computer, you never have to worry about leaving your proposal at home. Who doesn’t want to save money?? Depending on how many records you have, yes it can be expensive to use a scan service to get everything started. But what about after that? You don’t have to spend money on storage space anymore and your employees will save valuable time trying to find misfiled documents, and everybody knows that time = money.